. : Dishing out extra helpings of Pain: Silverstar Race Report :: Ski XCOttawa.ca :: Skiing in Ottawa and Gatineau Park :. Silverstar is one of the best early season venues available to us in Canada and increasingly, the United States. Just about everyone who is anyone on the North American racing scene makes an appearance at these NorAm races. This year was no exception as over 120 guys and 80+ girls showed up to see who's gotten in shape quickly this year. I showed up at Silverstar with close to the worst preparation for the races possible. As most of you will know, the season has been a little late starting out east, and I had only 3 days on snow before leaving for B.C.. The entire week before I left I was exhausted from a cough, exams and, I suspect, overtraining. With my last exam finished a mere 72 hours before the first race, I packed my bags, hopped on a plane and made my way to Silverstar. The first ski I went on was painfully slow. The cold temps, fresh snow, altitude and jet lag all found their own way to slow me down and make every stride an effort. I was still sick the day before the first race, and was seriously considering not even starting. Come the morning of the 15k skate, my cough had cleared up a bit and I managed to convince myself that racing would be a good idea. I felt sluggish in my warmup, but sort of expected that, seeing as it was the first race of the year. I knew from last year (I dropped out of the same race in 2008) that pacing myself would be key. I really held myself back up the first hill and tried to fall into a steady rhythm. Practically as soon as I thought I had a good pace set for myself, I heard Andrew Stewart-Jones coming up behind me, 30 seconds ahead of me by 1.5km into the race. I was helplessly weak and all I could do was watch as he steadily glided away from me. I held it together, more or less, for the first lap of the race thinking I would get a second wind if I just held on. Going into the second lap however, I could feel that something was wrong. My legs weren't flushing lactic acid at all. It seemed like every stride just pumped more pain into my body. The last 8km or so are surrounded in my memory by a haze of pain. Short of stopping, it seemed there was nothing I could do to get rid of that pain. The numbing, deafening shout from my legs. The acrid taste of blood in the back of my throat. The stinging of my frozen eyes as I forget to blink. The frozen soup of air forming icy shards that attack my throat. The limp, useless weight of my arms. The mental anguish of a finish line infinitely far away. The all-encompassing scream that keeps going on and on and on and on and on. That was the gist of my race on Saturday. Afterwards, I collapsed and coughed my lungs out for 10 minutes. Hot gatorade never tasted so good. Overall, I was 88th in open, 25th in Junior and almost 7 minutes off the winning time. 7 minutes on a 15k. Surprising to me, I actually felt better that night than I had for the past week or so. The next morning, Saturday's race was a bad dream. The qualifier for the sprint went well, I was snappy, moving fast and had power all the way to the line. I qualified fifth, and after being lucky loser in the quarter final and powering to second place in my semi final, I made it to the A-final. I knew from the previous rounds that a good start was key to doing well. Unfortunately, I hadn't put that into practice in the quarters and semis, and I always seemed to be fighting an uphill battle. I made a better go of establishing myself in the final, but once again, I got boxed out and was 6th around the first corner. A lot of hard work put me in fourth, but I was so spent that I slipped another spot at the line to finish fifth. I believe I had it in me to medal in that race. Unfortunately, it wasn't quite my day, but it was a very welcome improvement over the disastrous previous race. After an awesome game of shinny with CNEPH and NTDC that evening, the Yukon team packed up and headed out at 3:30am for home. With delays in flights and a bag nearly sent to Hawaii, I made it home mid-afternoon, ready for a few weeks of skiing, food and recovery. 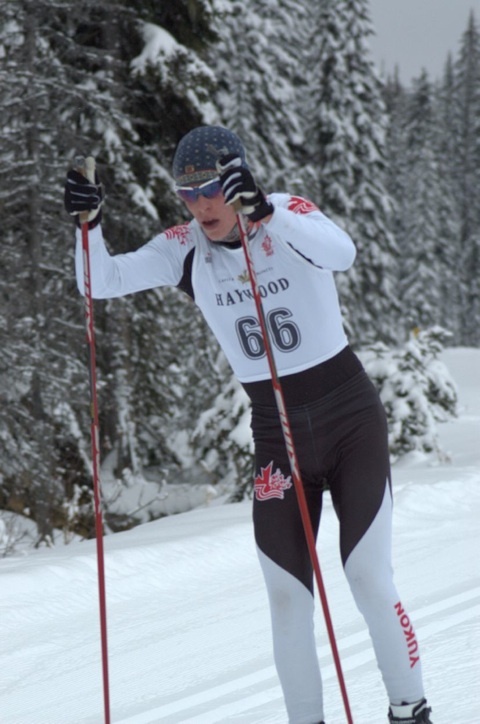 XC News: Infinity Ski Poles Partners with XCOttawa.ca!